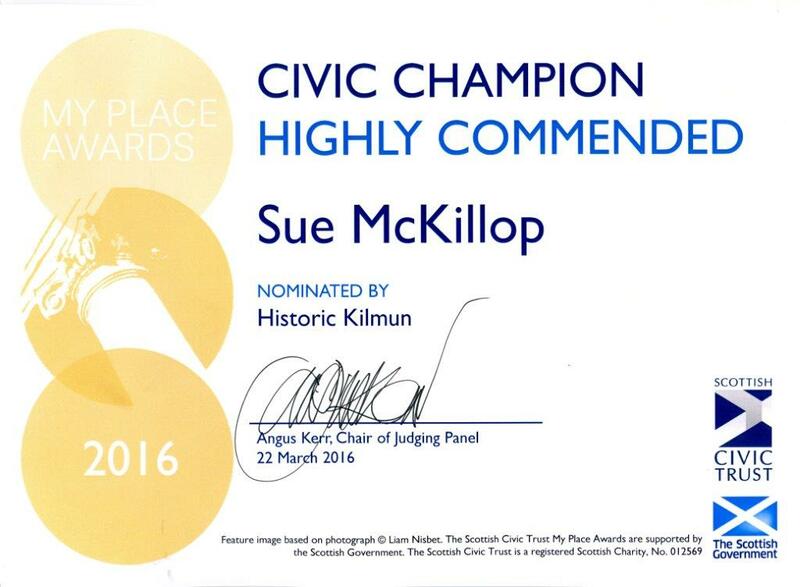 Historic Kilmun and Visitor Centre Manager Sue McKillop have been recognized by the Scottish Civic Trust Awards 2016 with the presentation of certificates in their awards ceremony in Glasgow on 22nd March. 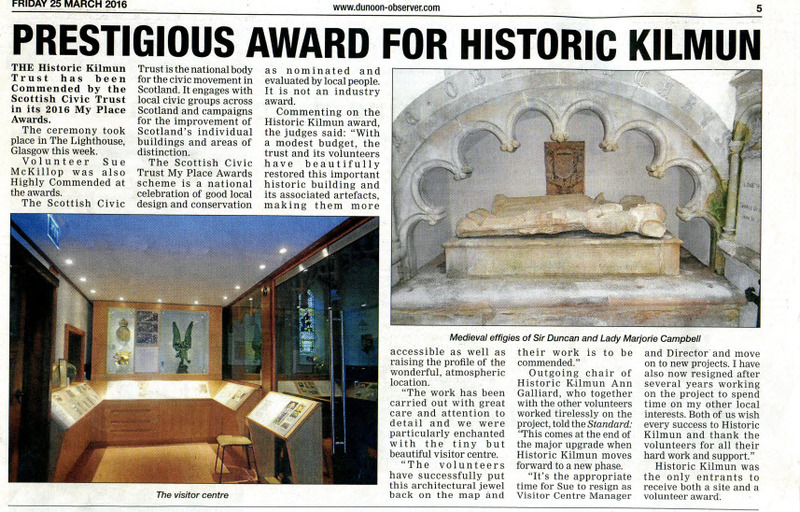 This year the awards attracted record numbers of entries ( in the region of 2500 ) however both HK and Sue were selected by the judges to be in the short list and invited to the awards ceremony in the Lighthouse in Glasgow. At the ceremony HK were awarded one of three Commended Certificates in the 'My Place Awards' and Sue was awarded a Highly Commended Certificates in the 'Civic Champion' category , also one of only three awarded. 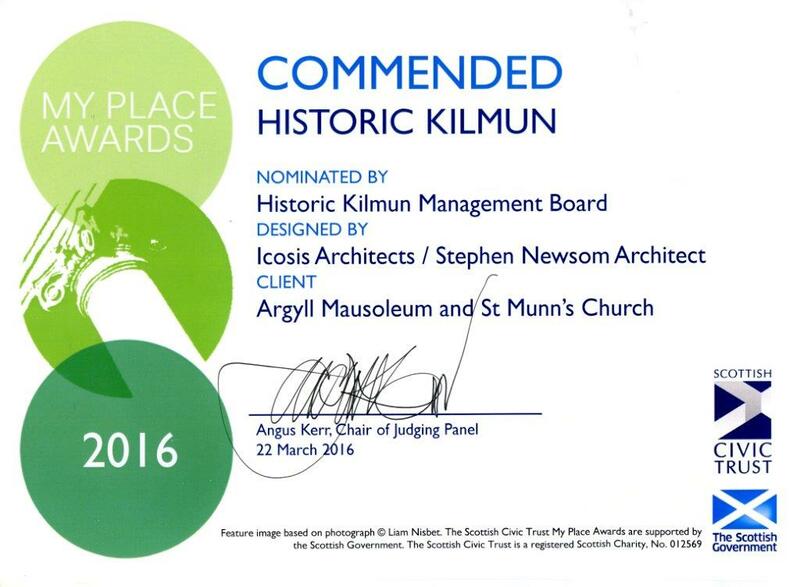 It is a great honour that of all the entries Historic Kilmun was the only orginisation to win in both categories for 2016. Argyll is a part of Scotland that I often consider to be headscratchingly unexplored. While the Southern Highlands are assaulted by the tourist droves, so many tend to be passing through on the headlong charge to Glen Coe, Skye, Mull et al. Few take the time to spend more than the odd leg stretching moments to actually explore some of Scotland’s most beautiful, and accessible, scenery. This weekend I’m doing my bit to put that right by paying an overnight visit to the stunning Ardkinglas Estate on the shores of Loch Fyne. Tucked away on the shoreline of the loch, Ardkinglas House itself is the work of Sir Robert Lorimer and is one of the most characterful homes in Scotland. Impressively designed, the exterior seems almost to have been put together in jigsaw style format and it’s no wonder that it has been a popular filming set over the years. It even doubled for the Isle of Harris – which is an amusing thought – in the film The Rocket Post. It was Sir Andrew Noble that recruited Lorimer for the building of his home, with absolutely no expense spared, and the result was a state-of-the-art, fully bespoke mansion that still serves as a family home today (over 100 years after its completion). The interior is nothing short of miraculous. Heavily reminiscent of Kellie Castle in Fife, the furnishings and atmospherics have remained seemingly untouched. Massive fireplaces, lavish wall-dominating artwork, chilly tiled hallways and endless personal decorative touches make for a wonderful tour of wealthy family life in the 20th Century Highlands of Scotland. Public tours of Ardkinglas House are only available on Fridays and outwith that it is best to call ahead to book. The House Gardens are the definition of tranquillity. With the House being private, you will very likely have them all to yourself. For those keen on further walking, there are several kilometres of routes within the wider Ardkinglas Estate and they easily make up for a half day’s worth of activity in themselves. Look out for Abies Grandis, that has several times claimed the title of the tallest tree in Britain! I stayed in the Butler’s Quarters, a nook of the House that allows for privacy and an incredibly authentic experience. Aside from a couple of mod cons there seems precious little that has changed here over the generations and it is very much a step back in time. Getting the fire revved up I’m pretty much expecting to hear the ringing of a bell to notify me of some task needing seeing to…..
A wonderful additional attraction to Ardkinglas, other than the seafood you’ll find at Loch Fyne Oysters, is a drive south into the Cowal Peninsula to the remarkable Argyll Mausoleum and Kilmun parish church. Only accessible by arranged tour, the heavy and forbidding Mausoleum doors hide a stunning tomb looking back at centuries of history for the powerful Clan Campbell. An effigy of Sir Duncan Campbell and his wife Marjorie of Lochawe dominate the space, one of the most eerie and goosebumply I’ve experienced. It is believed that Clan Campbell chiefs have been laid to rest here since the 15th Century. The adjoining parish church is still very much active and the tour guides do a wonderful job of unearthing its own history. The origins can be traced back to the 7th Century and St Munn’s establishing of a monastic community here. Some of the 12th Century remains are still standing, just about, as is the country’s only functional water powered organ! 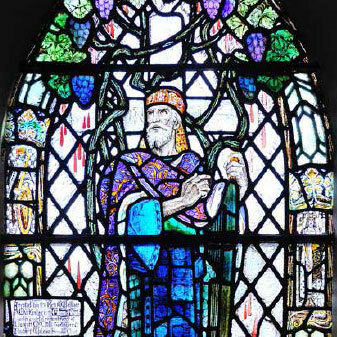 Most impressive of all is the magnificent 19th Century stained glass that brings an otherwise plainly decorated structure to life. Each telling their own story, the level of intricacy is one rarely seen. There is even one of Jesus doing his best at an Axl Rose look. The church graveyard is, as you would expect, a sombre spot but one filled with amazement as it holds the grave of Elizabeth Blackwell MD, the first woman doctor of modern medicine. Scotland’s pioneering celebrities continue to amaze. A gravestone dating as far back as the 8th Century can also be found, thought to have belonged to an early Kilmun abbot. If you are looking to pay a visit to the Mausoleum, be sure to enquire ahead to avoid disappointment as it is run on a voluntary basis. The drive into the Cowal peninsula from Ardkinglas is a stunning one. Following the shoreline of first Loch Fyne and then Loch Eck, it is a road less travelled, but one that is steeped in some of Scotland’s most ancient and significant history.